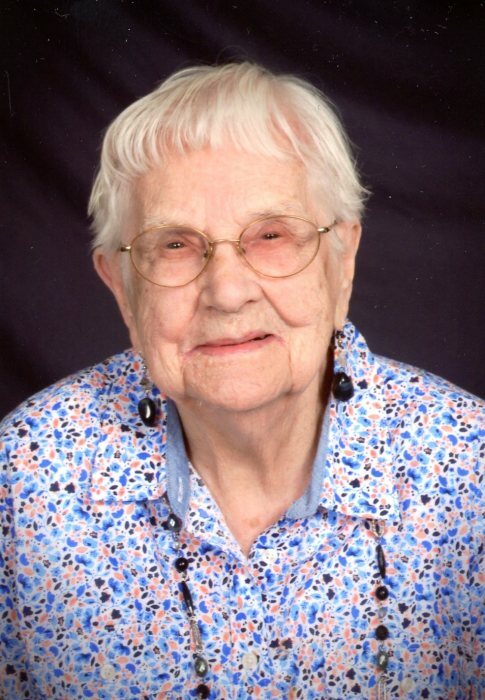 The funeral for Fern Zimmerman, of Chokio, Minnesota will be held on Saturday, December 8, 2018 at 1:30 p.m. at the Trinity Evangelical Lutheran Church, near Johnson, Minnesota, with Reverend Eugene Andrus officiating. Visitation will be on Saturday one hour prior to services at the church. Burial will be at the Trinity Lutheran Cemetery, Johnson. Fern Amelia Kroening, daughter of Emil and Margaretha (Puchta) Kroening was born on November 10, 1916 in Sanborn, Minnesota. The family moved to Stevens County in 1920, where she grew up on the family farm with her six sisters and four brothers. Fern attended District #20 country school near Alberta, Minnesota. As a teenager, she walked three miles into Alberta for violin lessons. Fern graduated from Morris High School, Morris, Minnesota and Moorhead Teachers College in Moorhead, Minnesota. Over the years, she taught at several country schools in Stevens and Traverse Counties and did substitute teaching in Chokio Public School. Fern was united in marriage to Harvey Zimmerman on November 30, 1939 at Peace Lutheran Church in Morris. The couple was blessed with four children: Daryl, Gary, Sheryl, and Keith; and lived on the family farm north of Chokio. Fern was an active member of Trinity Evangelical Lutheran Church. She always told you she was proud to have the same birthday as Martin Luther. She was very involved in the community; helping establish the Chokio Senior Center, where she enjoyed going there to play cards until she was 100 years old. She was Stevens County Outstanding Senior Citizen in 1987, and was named to the Governor’s Council on Aging. Harvey and Fern were able to enjoy many trips together during their retirement. Fern loved watching her children and grandchildren play sports. She was an avid Twins and Vikings fan. Fern never mentioned it, but her sister, Marty told us how athletic she was, especially at playing softball. That might make it easier for many of our family to understand our competitive nature! Fern passed away on Friday, November 30, 2018 at the Courage Cottage in Morris, Minnesota, under the care of Knute Nelson Hospice. She was 102 years old. She is survived by three sons: Daryl (Gerilee) Zimmerman, Chokio, MN, Gary (Diane) Zimmerman, Rockford, MN and Keith (June) Zimmerman, Alexandria, MN; one daughter: Sheryl (John) Holsten, Alexandria; one sister: Juline Henderson, Las Vegas, NV; two sisters-in-law: Olga Kroening, Phoenix, AZ and Ruth Zimmerman, Chokio, MN; 10 grandchildren, 11 great-grandchildren and 2 great-great-grandchildren; and many nieces and nephews. Fern was preceded in death by her husband, parents, four brothers, Loren, Carl, Norman, and Herman, five sisters, Evelyn Kussatz, Nora Morris, Lucinda Madison, Esther Hanney, and Martha Kroening; and an infant granddaughter, Staci Zimmerman. Pedersen Funeral Home is in charge of the funeral arrangements. An online guest book can be signed at www.pedersenfh.com.